As pretty much anyone with taste buds can attest (that should be all of you... right?? ), the crouton traditionally served on top of French onion soup is kinda the best part of the whole experience. It's crusty, it's cheesy, it's healthy (again: right??). 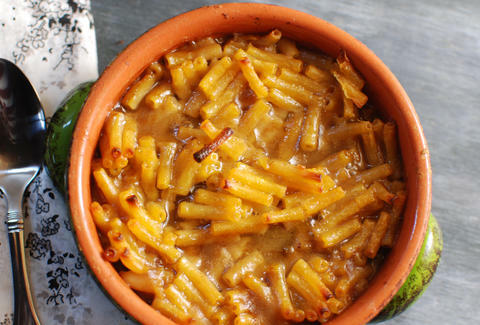 But there's one thing it's not: MAC & CHEESE. Fortunately, Dan Whalen over at The Food in my Beard has decided to change all that. The dude's apparently been brainstorming things that could replace that crouton, or even make it better... and he landed, quite logically, on mac & cheese. All you have to do is make the mac & cheese ahead of time (with a little extra cheese), chill it in a thin layer, and then cut it into rounds using the same bowls you're baking the soup in. You can check out the full recipe and instructions right here. Cheers to American ingenuity. Adam Lapetina is a Food/Drink staff writer for Thrillist, and thinks the current state of Franco-American culinary relations is strong. Read his musings at @adamlapetina.